Walk into any makeup and beauty store, and you would face a bewildering array of choices when it comes to just about any product, and foundations are no exception. Gone are the days when there was just one thick cream for every skin type and color. From tinted moisturizers to full-coverage stick foundations, there is something for everyone as long as you know what you are looking for. Here's a handy quicklook guide. 1. Tinted moisturizers: These aren't true foundations but are my favorites for the summer when I want the least amount of product covering my skin. Tinted moisturizers are lightweight lotions with a a bit of color added in. They provide minimal to no coverage and are best for people with clearer complexions or if you don't mind the blemishes showing through. Use clean fingers to apply, starting with the center of the face and working outwards followed by a light dusting of matte foundation/powder to soak up any shine. 2. Cream/souffles/mousse foundations: I have clubbed all the varieties that come in jars and tubs along with the creamy ones pressed into compacts in this category. This formula has a thicker consistency and provides a medium to heavy finish. Cream foundations work best for normal to dry skin while souffles/mousse (the oil-free ones) work best on the the more oil-prone skin. Though these creamy foundations can be buffed in with brushes, I find it easiest to use my fingers for application. A damp sponge also works, especially with drier textures like the cream-to-powders. The finish can get cakey if piled on all at once, so build up in layers for a better finish. Start sheer and reapply only in areas that need heavier coverage. 3. Liquid foundations: These combine the best of both worlds - the lightweight feel of a liquid with the coverage from the creams. Best for when you want medium coverage, like for uneven skin tones and marks, but can also be built up to provide heavier coverage for blemishes without looking too dry. Pick an oil-free formula if you have oily/combination skin and look for more nourishing ingredients like vitamin E if you have drier skin. 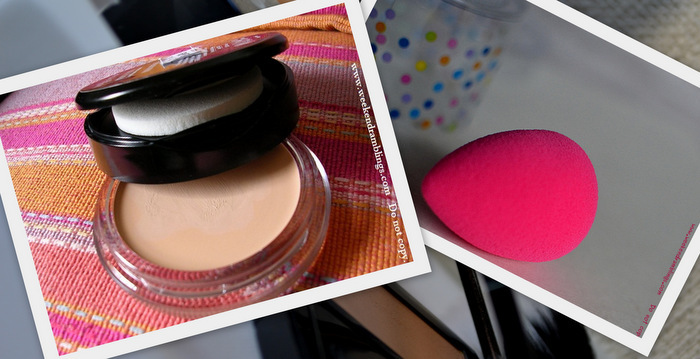 My pick for applying any liquid foundation has to be the stippling brush - gives even coverage without the heaviness. You can also apply this with your fingers, a moist sponge, or both (using the sponge to even out the application). 4. Powder Foundations: Providing sheer to medium coverage, powder foundations are the best pick to hide the shine while give a polished yet light application. These are available in both pressed as well as loose finishes, and I prefer the travel-friendly pressed versions. A light dusting over my tinted moisturizer is all I need on a hot summer day! Apply powder foundations with a brush for sheerer dusting or a sponge/puff to press more evenly into the skin to help with minimizing pores and get more coverage. 5. Stick foundations: I have never actually bought one of these, though I do remember using it, borrowed from a friend (back when none of us thought twice about sharing makeup). This formulation is for those looking for thicker coverage and also has the advantage of being easy to carry around. Because of the thicker texture, stick foundations can also double as spot concealers. To apply, press the stick directly on to the skin and use fingers to blend. I like to pick up product on clean fingers/Q-tip/brush and then apply.